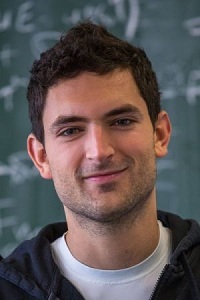 I studied physics at the University of Tübingen with focus on computational physics and got my Diploma in spring 2013. After my last exam, I joined the group on numerical particle methods of PD Dr. Roland Speith in order to carry out my student research project. This group simulates collisions of pre-planetesimals by means of Smoothed Particle Hydrodynamics (SPH). In my project I investigated the consistency and stability of the Tübinger SPH code parasph by comparing the disruption of rotating cylinders with analytic calculations. I accomplished my diploma thesis in the Computational Astrophysics group of Prof. Wilhelm Kley. The main part of my thesis consisted of writing a two-dimensional hydrodynamics code using a moving Voronoi mesh and challenging it with several test problems. In this approach, it is required to calculate a Voronoi tesselation from a cloud of mesh generating points (Voronoi particles) in each timestep. For this purpose, I use Steven Fortune's sweep line algorithm. The Euler equations are then solved with a finite-volume method on the grid provided by the tesselation. At the end of each timestep, the particles are moved according to the velocity field of the fluid in order to ensure Lagrangian behavior. From 2013 to 2016 I worked as a PhD student at the Heidelberg Institute for Theoretical Studies (HITS). I was supervised by Prof. Volker Springel, who is the author of the Voronoi code AREPO. The code is used for simulating the formation of large-scale cosmological structures and galaxies in our universe, e.g. Illustris. My first PhD project consisted of developing an algorithm for detecting and characterizing cosmological shocks in simulations. Hydrodynamic shocks play a crucial role in the evolution of our universe by thermalizing kinetic energy of gas flows, thereby heating the universe. Moreover, cosmological shocks can accelerate particles to relativistic energies, creating so-called cosmic rays. In my second project I was working with an international team of mathematicians led by Prof. Christian Klingenberg on novel numerical methods for solving the fluid equations. We have successfully designed and implemented a higher order Discontinuous Galerkin (DG) method on a structured mesh that can be adaptively refined. Click at the link above in order to view a list of the courses and conferences I attended, and the events I am going to attend in the near future. Below you may find several movies of simulations produced by the code I wrote for my diploma thesis. There are more movies on my YouTube channel.